These spoons are everyone’s favorite decor item in my whole house! And its easy to see why, its a simple, unique way to take up a good amount of space. Plus it is SO CHEAP and SO EASY! 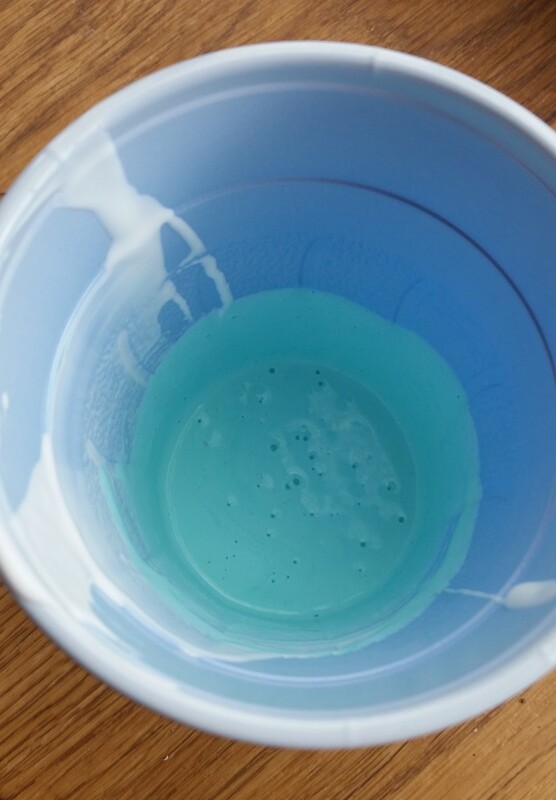 Mix your colors in varying amounts with the white paint or do some without any white, in cups. You don’t need much in each cup. 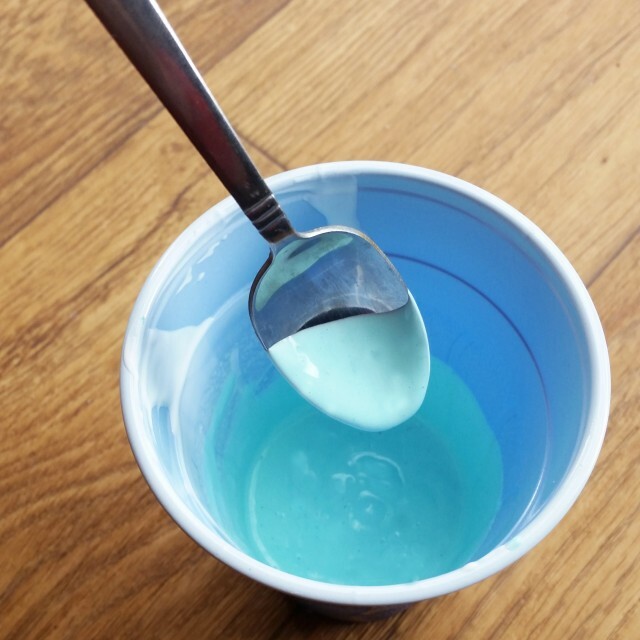 Dip your spoons into the paint and tilt the cup to get a higher reach, do them all to varying levels and angles. Then tape it onto the edge of something (I used my kitchen table) and put something underneath for them to drip on to. Let them stay there overnight, you can slightly jiggle them to coax drips into falling. 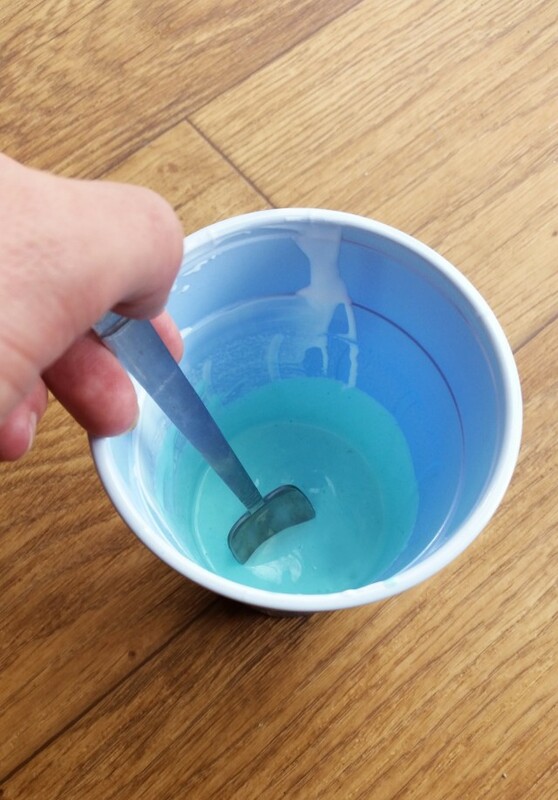 If there is a drip that ends up drying to the spoon, you should be able to just smooth it out with your finger/fold it over the edge to hide it in back, while the paint is still rubbery. To hang them, first figure out how much space you’ll need. Measure your longest spoon (mine was 7.5″) and this will be the height of each row you do. 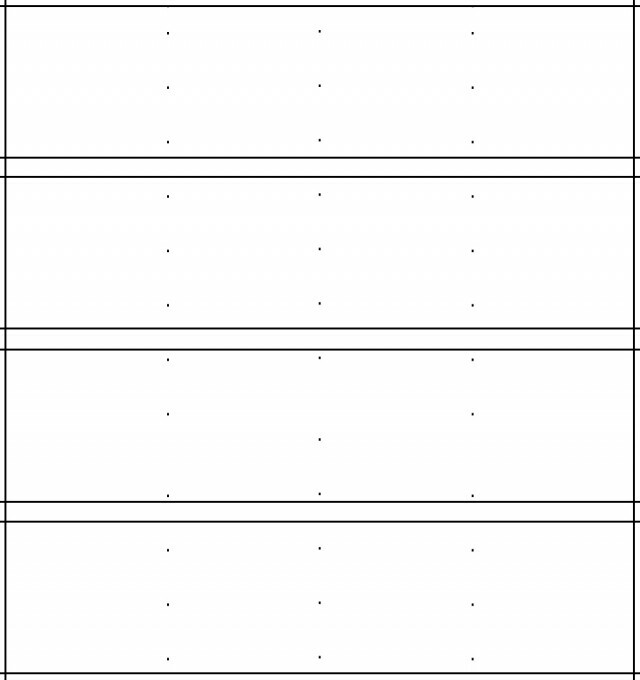 I also added an additional 1″ between rows. 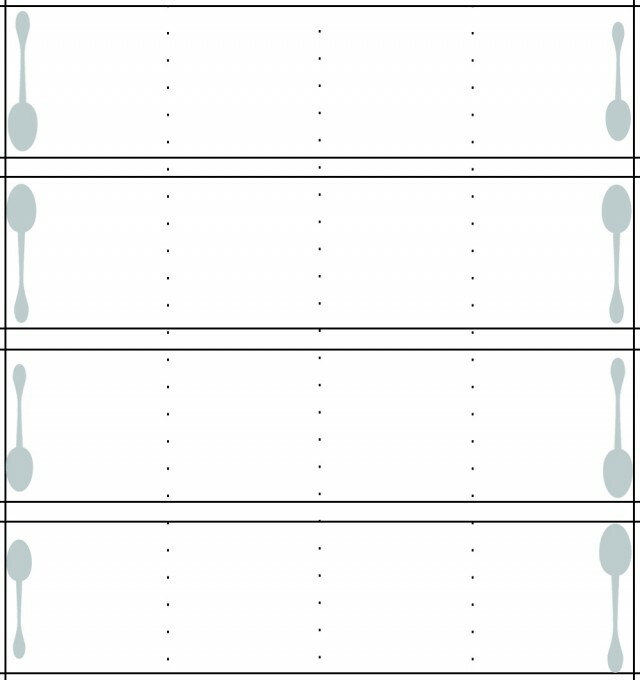 I allowed about 3.75″ between each spoon. 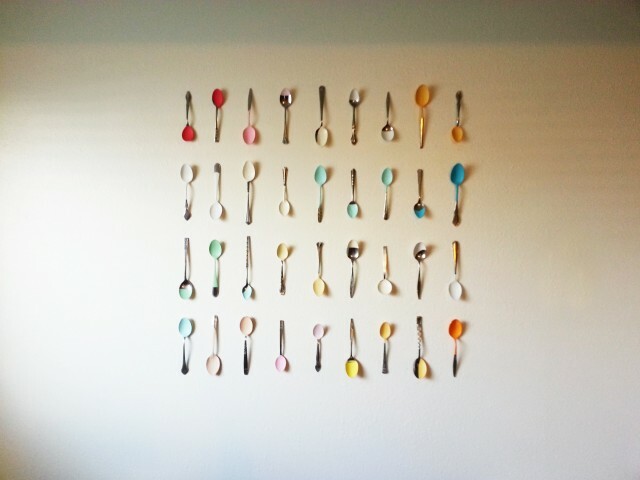 I had 36 spoons so my total measurement was 31″ x 33″. Measure to where you want the middle of your display to be and make marks, then measure out from this 15.5″ in each direction, make marks and tape string along them. Measure down from the ceiling to where the top will be and tape string along this, measure down from that 7.5″, tape string, down from this 1″ and tape. Do two more sets of 7.5″ and 1″ and then one more 7.5″. From the middle marks, measure out 7.5″ in both directions and make marks there. This is what your final should look like. The solid lines are string and the dashed are the pencil marks you’ve made. (Adding the string is intended to make it easier as you’ll need far less pencil marks, just 2 or 3). I laid my spoons out on the ground first to get my set up right. This should be the spots that are most curved out/will be actually touching the wall. I doubled up on tape for the tip of the handle part. Now place your edge spoons in each row, remembering to alternate up and down and matching the edge of the bowl to your string. I just eyeballed where the spoons should go to be centered. Now add the spoons onto the marks you’ve made, they should be centered right over the marks. 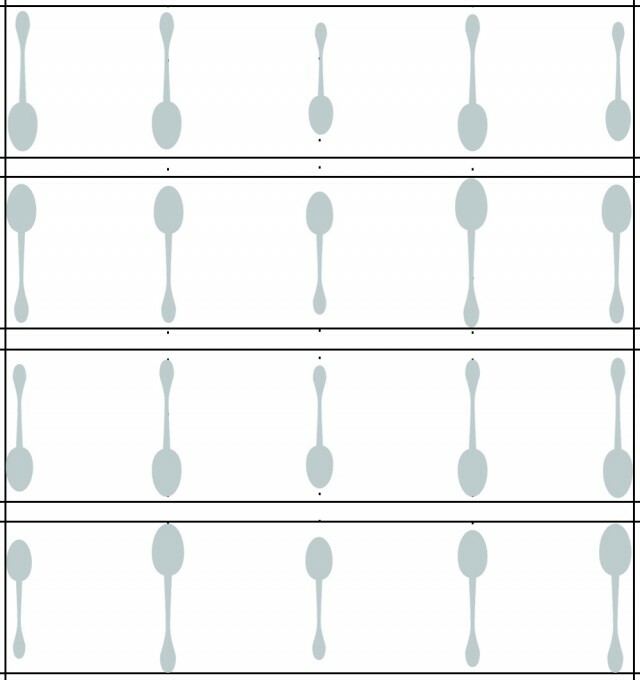 All of the spoons currently in each row should be facing the same direction. 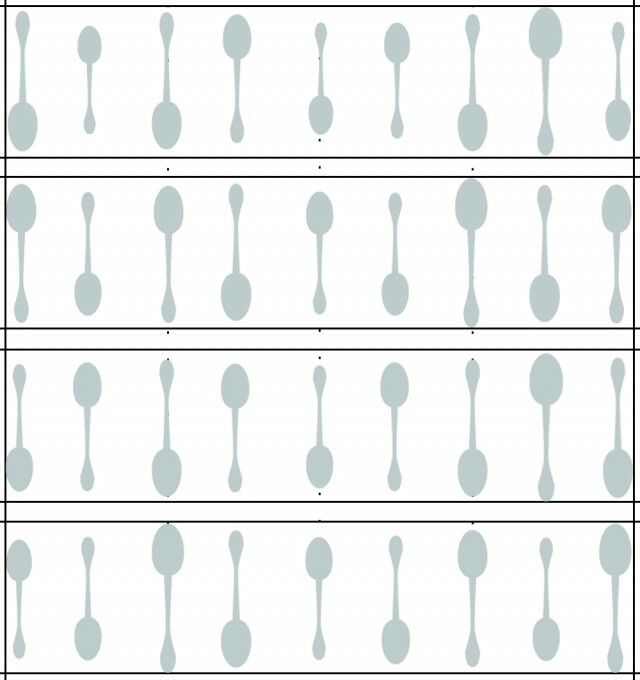 Here, I just eyeballed where the rest of the spoons should go, centering them in between each one. All of these spoons should go the opposite direction of the spoons already in that row. Now you can remove your taped string and erase any visible marks and you’re done! Thank you Rachel! Hanging things straight is always tricky! For hanging things straight, you can’t beat a laser level. I bought one for my husband years ago and I’m the only one who uses it! It beams a red line that makes it so easy to line things up, especially a project like this. That would be SO wonderful for a project like this! Thanks so much for the idea! This is such a clever idea! It looks so lovely in your space too! Would you please come by and share it with us at The Makers link party over on my blog? If I just heard about this project without seeing the AMAZING outcome, I don’t think I would’ve been on board. As it stands now though, I’m ready to go spoon-thrifting! Love this fun idea. Oh my gosh – I LOVE this! I’ve never seen anything like it. So creative and colorful. Great job!!! You are way too sweet Bre! This is such a fun idea, and something I’ve never seen before. LOVE it! Thank you so much for sharing it at The Makers and we hope you will stop by to party with us this week! Absolutely will post again! Thanks so much for the invite! Marlin’s Pants!! It’s bloody brilliant. Love love love the idea. I have just one concern before I do them too- double tape holds it properly? I’m definitely trying them out. Yep! The Uline 3M 3⁄8″ foam tape holds them up great! I haven’t tried it with any other double-sided tape but I’m sure any industrial foam tape would work great! Wow! What an effective idea! Love this! Plus with using tape I don’t have to put holes in the wall of my rental but still have something cute to put up. Thanks for the super cute idea, I’ll be hitting the thrift stores this week for sure! 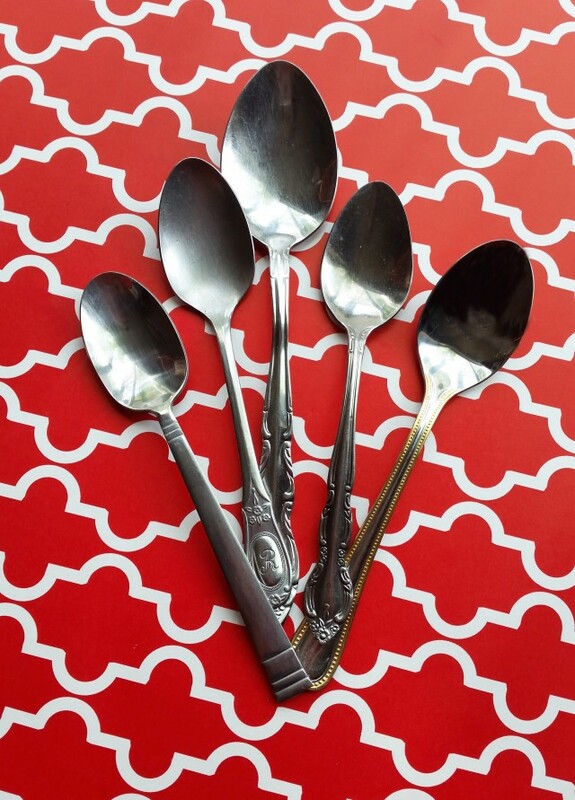 I was so enamored I immediately went out and bought 40 spoons from my thrift store – for 5 dollars! I was so psyched for this inexpensive and amazing DIY. However, I’ve now done about 20 spoons and I wondered did you have to water your paint down at all? 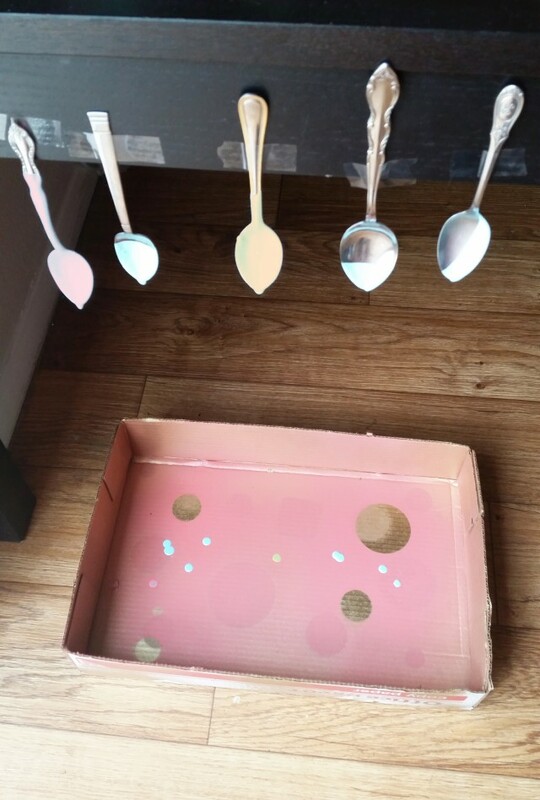 I purchased paint that was as close to your example (which looks like Joann Fabrics products but sadly I have zero near me and no car), but it was definitely a little thick AND now a lot of my spoons have either tiny bubbles or the remnants of bubbles – because it didn’t really drip well. I had to tap pretty excessively being careful not to disturb the paint. I ALMOST put some water in there, but didn’t know what it would do to the paint. Any ideas for the rest of my spoons? Also, I’m a little concerned the foam tape won’t stick well to a paint covered back of the spoon…. Oh no Blair, I’m so sorry to hear you’ve had trouble with your paints. Sometimes I feel like the paints in craft stores may have been sitting on the shelves too long and have thickened up so that they’d definitely be hard to use for a project like this, maybe that is the case? 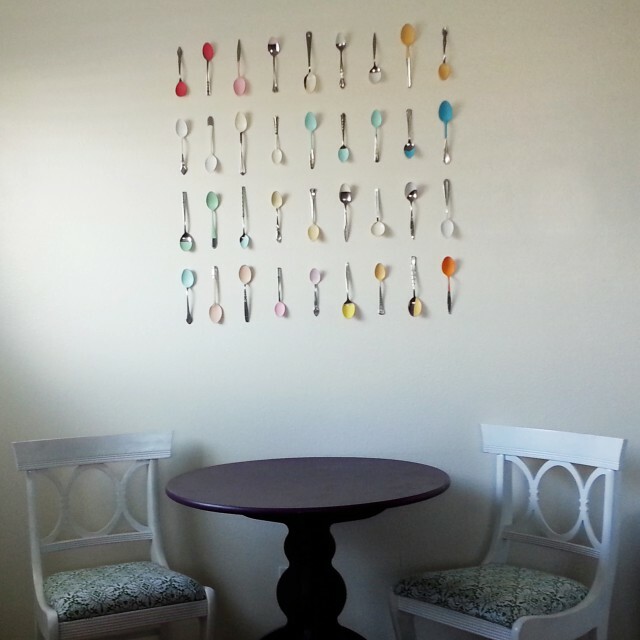 For the majority of my spoons, I mixed some of the enamel paints with regular white latex wall paint in a gloss finish. I think that would definitely help get your paints to a more usable thickness. If that’s not a possibility for you, I think the spoons would still look great if you just used a paintbrush and did a few layers. I do know that some of my spoons didn’t quite drip cleanly and the bottom of the spoon was left with a little extra half drop of paint. For these I just sort of folded that paint over the bottom and on to the back of the spoon while the paint was still soft but not wet. 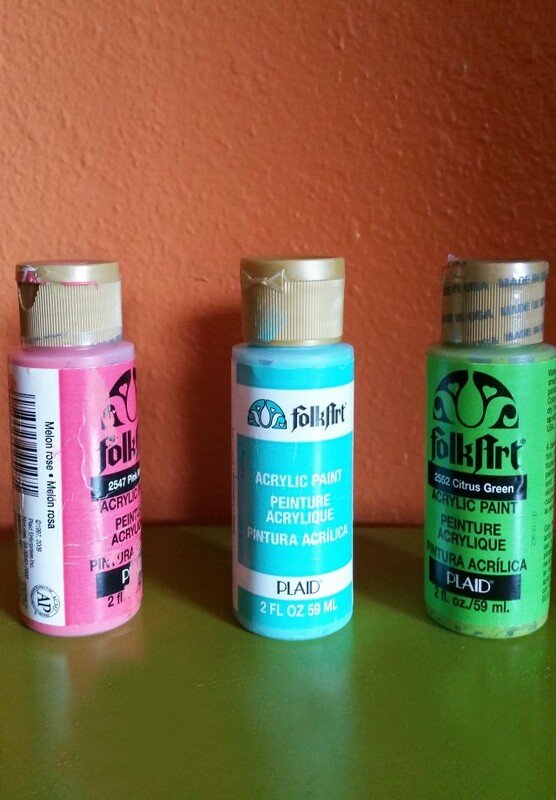 As far as the tape, I’ve never had problems with it sticking to the paint but I can really only speak for the exact tape I used (there’s a link in the supplies list at the beginning of the post). If you’re having issues, there’s no reason the paint couldn’t just be scratched off the back as no one will see the backs anyway. Please let me know if you have any other questions or if anything I said didn’t make sense. I’d hate it if this didn’t work out for you as I’ve absolutely loved my spoons! Love these clever little spoons. 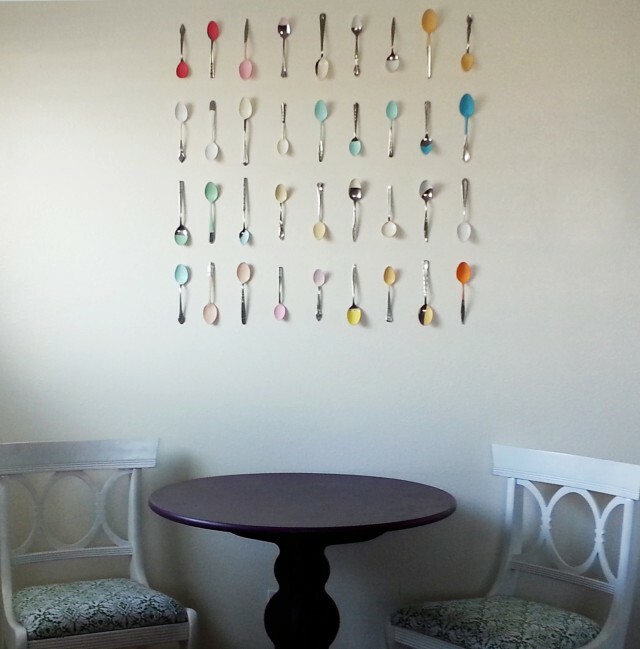 I’m thinking of using your idea but with fewer spoons and putting them in a large frame. Also perhaps knives and forks as well. Will let you know how the project turns out (if it’s worth talking about). Yes please do let us know Linda! Would love to see it! I loved this project so much, and I get nothing but raves from my guests over how unique and adorable it is! I’d love to post a photo so you can all see my before/after, but can you post photos in the comments? I don’t think there is a way :( do you have Instagram? If so definitely post a pic there and tag @ajoyfulriot, we’d love it! Either way, I’m SO happy you made it and love it.